Director/Story – Pete Docter, Co-Director – Ronaldo Del Carmen, Screenplay – Josh Cooley, Pete Docter & Meg LeFauve, Producer – Jonas Rivera, Music – Michael Giacchino, Production Design – Ralph Eggleston. Production Company – Pixar Animation Studios/Disney. Riley Anderson is born and grows up in Minnesota. Inside the control room of her head, the five emotions, Joy, Sadness, Anger, Fear and Disgust, vie for control of her states of mind. Riley’s parents then move to San Francisco for her father’s new job. Joy, who is in charge of happiness, tries to find something cheerful and upbeat about this but fights against Riley’s dislike of their new apartment, her missing her friends and being unable to play hockey. After a particularly embarrassing day at school, both Joy and Sadness are accidentally sucked up into the tube that sends memories into storage. With Anger, Fear and Disgust left in the control room, Riley slumps into a state of depression. Joy and Sadness try to make their way across Riley’s mental landscape back to the control room but Joy is alarmed at seeing crucial islands of Riley’s personality collapsing into the pit of permanently discarded memories. She tries to get back and save the day and prevent Riley from deciding to run away from home back to Minnesota. 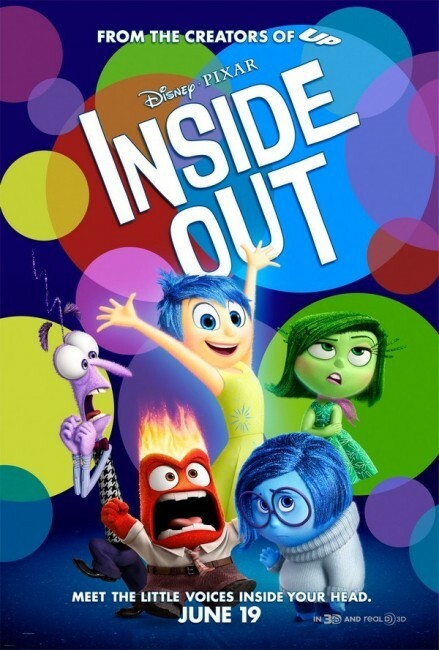 Inside Out was the fifteenth animated film for Pixar. It follows Toy Story (1995), A Bug’s Life (1998), Monsters, Inc. (2001), Finding Nemo (2003), The Incredibles (2004), Cars (2006), Ratatouille (2007), Wall-E (2008), Up (2009), Brave (2012), The Good Dinosaur (2015) and Coco (2017), as well as sequels to many of these. The 2010s has also been the dividing line between the point when Pixar descended into sequelitis, following a long and protracted struggle with Disney over the copyright of their characters. This has led to Pixar’s every second film now being a sequel with the likes of Toy Story 3 (2010), Cars 2 (2011), Monsters University (2013), Finding Dory (2016), Cars 3 (2017), Incredibles 2 (2018) and Toy Story 4 (2019), all of which have marked a decidedly lesser comedown from the peaks of originality the studio was scaling at the end of the 2000s with the likes of Wall-E and Up. Moreover, as part of the sweetheart deal with Disney, Pixar’s directors were granted unprecedented freedom to do what they like at Disney, only to promptly fall flat on their faces turning out massive live-action flops – Andrew Stanton with John Carter (2012) and Brad Bird with Tomorrowland (2015). 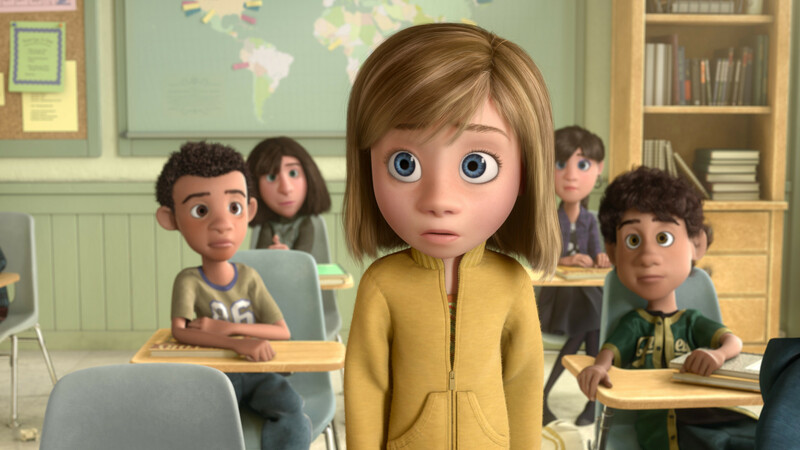 Apart from Brave, Inside Out is only the second work that Pixar has made in the 2010s that was not a follow-up to one of their previous films. Brave felt like a film that suffered from creative confusion and so it is left for Inside Out to be the first of their films of the 2010s to return to where Pixar were at five years earlier. Inside Out feels like a one gimmick film – that the insides of a person’s head are controlled by various personalities that embody emotions. The premise is very similar to the tv series Herman’s Head (1991-4) wherein we saw the life of the four temperaments inside William Ragsdale’s head, which consisted of Angel, Animal, Genius and Wimp. I was also reminded of the mind-bogglingly insane Hong Kong film Mad Detective (2007), featuring a detective who has the ability see people’s inner personalities. There is a good deal of fun to seeing the various personalities interacting. And especially in the way that the film has devised metaphoric representations of the various aspects of the mind – the dream centre is a film soundstage where recurring elements are treated as Hollywood stars; visits to the jail of the subconscious; an appearance from Riley’s ideal boyfriend. There is a good deal of amusement made out of a persistently recurring advertising jingle that keeps getting fired back up the tubes to play out on the screen. There is even more amusement when the film makes cuts away into the control rooms in the heads of other people, such as the parents during one dinnertable exchange and especially during the montage that takes place during the end credits. The film does have a number of credited psychiatric advisors on the end credits. Although you cannot help but think that some of its allegory for the inner workings of the human head make for bizarre ideas when the thinking is logically extended. It is something that goes back to the old Greek philosophy of the human mind and body being controlled by four temperaments – choleric, melancholic, phlegmatic and sanguine – which lead to pre-psychiatric treatments that believed that people’s ills could be changed by bleeding off the various biles that made up these. You also cannot help but wonder what would happen to a personality when Joy is abandoned to the pit of dead memories and is in danger of being permanently destroyed. Or what happens when a character like Bing Bong is erased but still remains alive inside the memory of Joy. The idea plays out with far more amusement and creativity than one thought it would have at face value. It becomes less like Herman’s Head and more akin to a film like Wreck-It Ralph (2012) with characters journeying across a colourfully wacky allegorical landscape in order to save the world. The idea of the mental landscape was also conducted in Robert Rodriguez’s The Adventures of Sharkboy and Lavagirl in 3D (2005), which similarly featured a Train of Thought, among other literalisations of mental states. 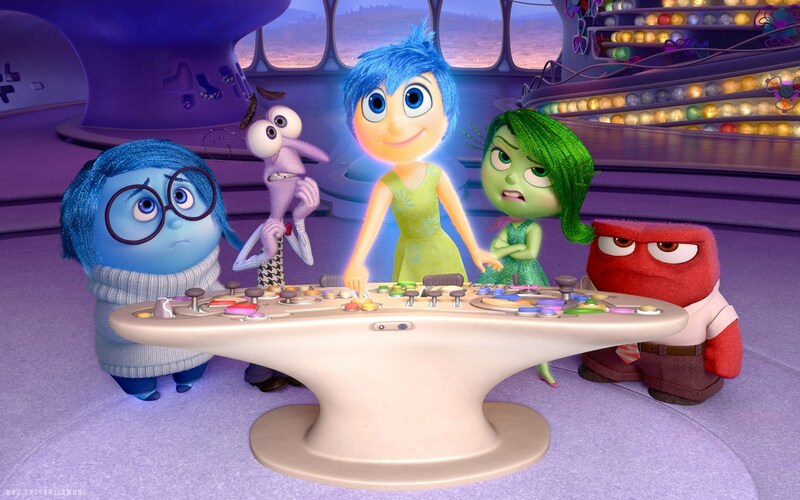 Inside Out is not up there with some of Pixar’s greater hits of the 2000s. It is however a good deal of fun and colour. The characters are vibrant and endearing, the humour hits the mix that Pixar do well, while the sacrifices and eventual ending reached leave few dry eyes in the house. It is Pixar finding their way back to what they do well. Not perfectly but a good step along the way.